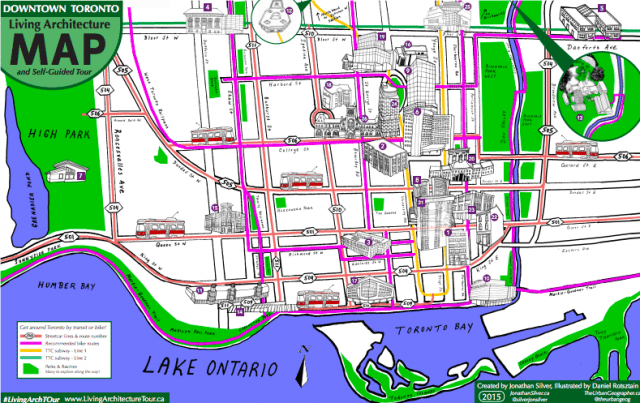 A new free, illustrated map lets locals explore the city's living architecture. Jonathan Silver was attending a conference on living architecture in Nashville, Tennessee when it occurred to him that the green-building gospel needed to be spread. Surrounded by engineers, architects, horticulturalist, landscape architects, green-roof experts, and materials-industry representatives, Silver realized that the average person not involved in the green-building industry might not be aware of vegetative roofs and walls. So, with the help of The Urban Geographer writer and cartographer Daniel Rotsztain, Silver set forth to map out Toronto’s living roofs. Now, that map—beautifully illustrated by Rotsztain—is available free of charge online. Silver’s impetus for creating the map was simple: total proselytization. A researcher in the philosophy of architecture and environment, Silver has spent the last two years finding practical outlets for his research. The #LivingArchTOur is his latest scheme, informed by the theory that living architecture offers a multi-sensory experience that, in turn, plays a key role in making a good city.